I've only used the Addis Ababa Airport twice but both times have been great. The airport is one of the finest I've seen in Africa and it's also relatively speedy. The staff are very polite and professional and very helpful. Bole International Airport in Addis Ababa is clean compact and effective. Arrivals was quick. (I recommend getting your visa prior to arriving in ADD as the visa application process does take a while) Clearing immigration and getting your passport stamp took no longer than 3 minutes. Bags took about 20 minutes to arrive and came out sporadically but all came safely and thats all that matters. Ethiopian customs x-rays all luggage prior to exiting so that took some time as well but you are dealt with in a professional and polite manner. As for departures your tickets and passports are checked prior to entering the terminal building and there is an x-ray and metal detector immediately upon entering. Check-in was efficient USA departures have their own area where you are asked the typical security questions. Your passports/visas are heavily scrutinized (presumably because of the large amount of fraudulent documents that make their way through ADD and airlines getting charged large fines for transporting these people.) Passing through immigration is a simple exit stamp and you proceed upstairs where there is a fair amount of duty free shops and eateries. There is another security check to enter the specific gate area (and might I add the metal detector in the gate is extremely sensitive). Overall ADD is a clean and efficient airport with no major problems or difficulties encountered. 4 stars only because they could use a better selection of eateries. Arrived Addis at 6am - luckily most passengers were in transit so entering was easy but time consuming. First you need to get your visa stamped in your passport then you can proceed to passport control - very lengthy passport check. To exit baggage area you must xray your bags no line control which is a pity. Terminal clean and modern but toilets smell horrible. Late night departure was easy as very few departures still every step takes forever. Duty free decent but wont take local currency which is annoying. More security at the gate and then its a trap if the flight is delayed. Any trip to the bathroom requires a new security check. 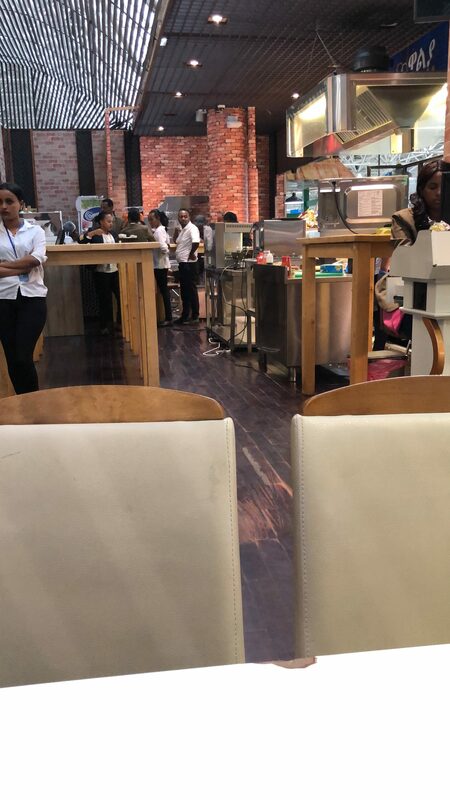 "leave a lot to be desired"
Addis Ababa's Bole Intl Airport is a new 5 gate terminal. On arrival immigration does take some time but you are dealt with in a courteous and professional manner. 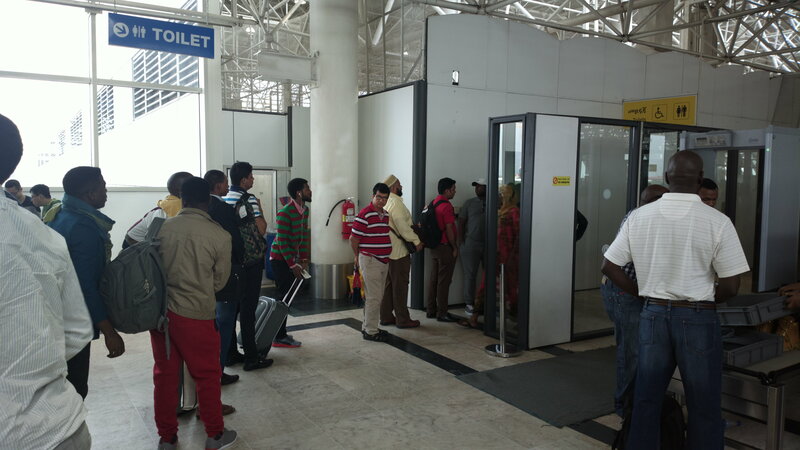 Although there are signs on the queue's - (Ethiopians Visitors Diplomats etc) you can use any queue. The visitor queue was quite long so we walked up to the diplomat queue and we were stamped in with no questions asked. Luggage collection & customs are swift although all bags are x-rayed by customs. The terminal is beautiful with Ethiopian marble all over the ground and a lot of cultural artefacts throughout the airport. Departures/check-in is fairly swift immigration is a quick stamp out. Note that you are security screened immediately upon entering the airport and before entering your gate. The duty free areas have a nice selection of Ethiopian artefacts. I have to agree with comments below about the bathrooms - they leave a lot to be desired. "a clean and spacious airport"
Seems a clean and spacious airport. Quite a few restaurants in the departure area. Security is adequate. Not bad at all. I flew from South Africa to the Middle East via Addis. Upon my arrival on Saturday evening just after 9 most of my fellow airplane passengers ran to the "next" destination - the hotel voucher transit booth. When I got there I understood why the other ran! One big "Q" with only two staff issuing vouchers. I finally got my voucher and proceeded to the immigration booth - only one for all transit visitors although all the other booths' Qs was rather empty... Finally got through and waited for the bus - it was now already past midnight!!! And we had to get the bus the next morning at 06:30! Not much sleep left. The airport itself was clean. "not much traffic but high stress"
A nearly new airport with not much traffic but high stress. Check in always takes forever - regardless of airline or class. You then have to pass through a series of subsequent security checks before reaching airside. Passport control is quite quick outbound but less than fast inbound (depending on how many flights land at the time) Airside is clean and spacious with reasonable coffee bars and a few duty free shops selling all the usual stuff you don't need or want. I'm not sure how well the airport will look in 5 years time - it seems to be aging rather quickly. Clean spacious and modern. Staff is very friendly. Duty free shops are reasonable and has a good assortment of goods. Immigration is fast and courteous. All in all a very good experience. "can get a bit crowded"
Having read the previous comments wasn't sure about spending four hours at this airport. In fact it was fine - very clean a couple of restaurants/bars and a good selection of duty free shops. It can get a bit crowded when there are more than three flights due to depart but generally there are plenty of seats available especially in the area away from the shopping area. Immigration were friendly and fairly quick and the security process is what we have come to expect these days but certainly no worse than anywhere else. I have used this airport four times in the past six weeks and have no complaints - it is clean comfortable and hassle free. "staff are friendly helpful and courteous"
Ethiopian Airlines suggested by travel agent as a value for money airline between South Africa and Thailand. And indeed the stop-over periods at Addis Ababa seemed very good. But the airport itself negates the whole experience. While the whole airport is reasonably clean the toilets and basins left a lot to be desired. Seats missing taps not working leaking basis and toilets etc. The Duty Free Shop is the only saving grace; a surprising array of goods on sale at even more surprising prices. The staff are friendly helpful and courteous. There are not enough facilities for eating and drinking for the number of passengers in transit at any one time. 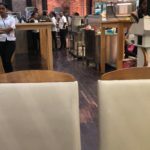 You have to grab a seat quickly at Addis as there aren't nearly enough chairs in the general area. Then your flight gets called about an hour and a half before you are due to leave; this is due to the most excruciating security check (transit passenger) where you virtually have to strip completely to satisfy the sensitivity of the metal detector. Naturally this takes a long time. On presenting your Boarding Pass you then have to hand over your Passport which is subject to a full immigration check - in transit? After all this rigmarole you are then summoned to the plane at once so be careful - you could get trampled on by the ensuing rugby scrum. This comes to a screeching halt halfway to the plane itself - yet another bureaucratic official is present; he reduces your Boarding Pass ticket to the size of a pinhead. And then you find someone sitting in your seat. Ethiopian Airlines were nice once airborne but that bureaucratic airport spoils the experience.